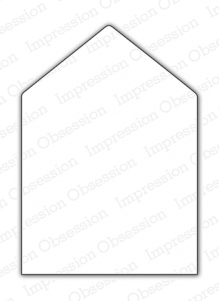 A house-shaped card is obvious, and this is such a great size for enclosure cards, tags, ornaments, etc. The accompanying dies are perfectly sized and can be used in a variety of combinations. 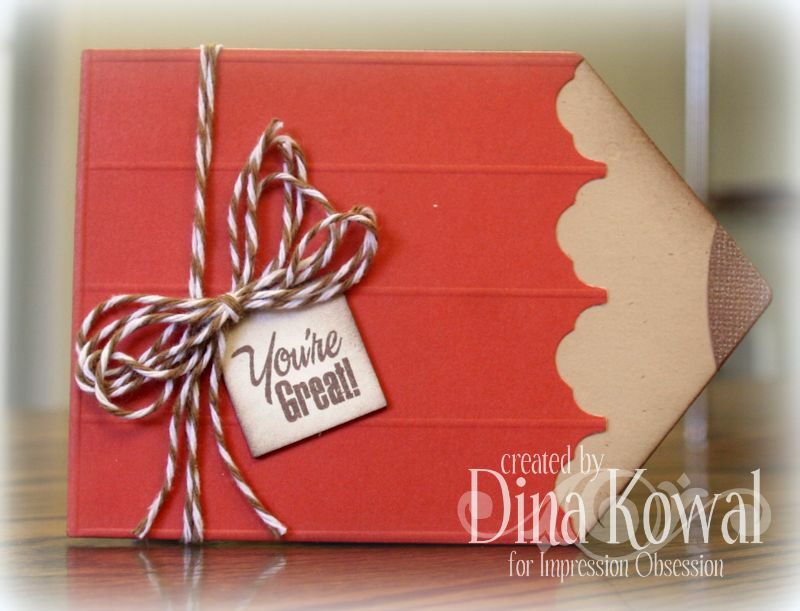 These types of cards are great for using up scraps of designer paper. I used the Mini Messages sentiment set on an Inchie Square here. These would make cute chipboard picture frames, too, with a square cut out of the center, and I'm sure the size would be great for charms made from shrink plastic too! A birdhouse is another possibility for the shape, and there is a sweet collection of dies for more realistic touches. For the roof edge, I just tucked the fence die under the rollers of my diecut machine part of the way, just enough to cut the top edge. 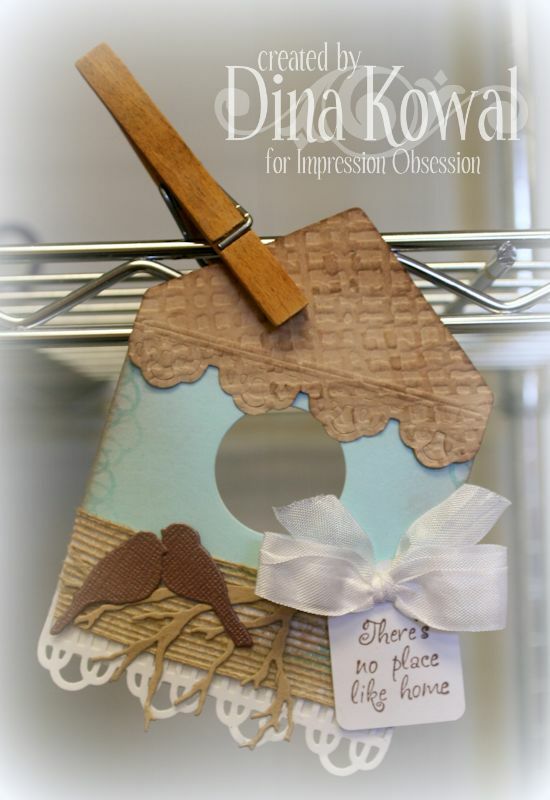 The sentiment I used is from the No Place Like Home cling set which coordinates with the dies. This pencil was my favorite to make - it would be a cute back-to-school card or teacher gift tag. Crayons would be cute with this shape too. I used the negative from the fence die to cut the edge of the colored section. The sentiment is from the Mini Messages set. Here's one last use for today - a pocket! I folded the edge over and used the fence die upside-down, lacing my ribbon through the openings. The stamp I used is called Pretty Peony and I watercolored it using Derwent pencils. You can find all the dies by clicking HERE! More are coming soon! Sooo......... what else could it be? Any more ideas for me?!! Four beautiful creations and what imagination to come up with these different uses of the house dies ! Great ideas! I love all of your wonderful projects! Especially love the pencil idea and that cute little birdhouse. I really like the little bird die as well. You could cut or fold the house in half for a boat of a sleigh or a pocket, or fold it again to make a paper airplane card...silly I know. Anyway, Thanks for sharing. Awesome creations, Dina!!! 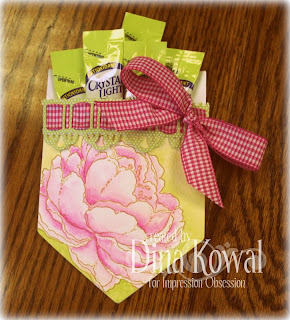 How creative, fun, and pretty too!! Love how versatile this die looks on all your super cute projects. The house is adorable. I agree, the pencil was a great idea. fabulous...love all your creations..so beautiful!!! These are so fantastic! Especially love the pencil and the pocket. Great details on all of them. TFS. 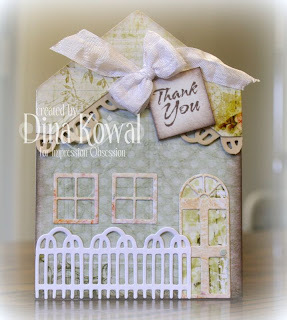 Gorgeous creations with this house die, Dina; and very inspirational! !